BGL Basics: How do I use the Food Plot feature? To add any item on the map, you must first click on the Add Items icon at the top of the camp map. 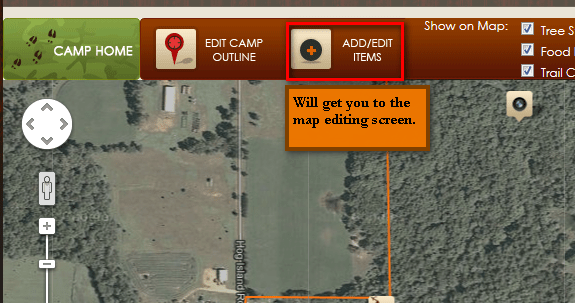 Once you are on the Map Edit screen, you must then click on the Food plot Icon. This will bring up a pop up window with another copy of your camp map and some other fields in order to identify your food plot. First you should give your food plot a name, something to identify it from the rest of your food plots. Next choose the soil type and soil drainage. This information can be helpful when trying to choose specific type of crops/seeds to plants. All of this information plays an important role when deciding on crops to plant. Now it’s time to outline your plot on the map. To do this, locate the area on your map, click on an edge of your plot to start the outline. Follow along the border of your food plot, clicking in a clockwise or counter clockwise motion. You must go in order and not bounce around or it will not work. Read the instructions on the bottom left of the pop up window to help. Once you have finished marking the boundaries, click Save. 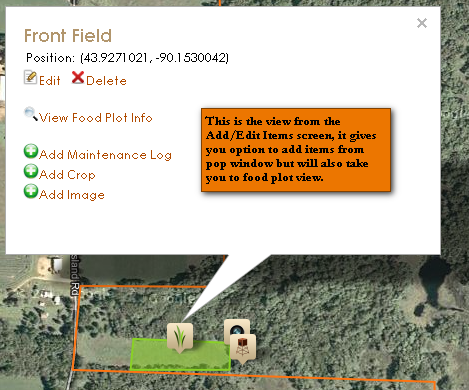 Now you will see your food plot highlighted in green with a plant icon in the middle. How do I update the food plot log? 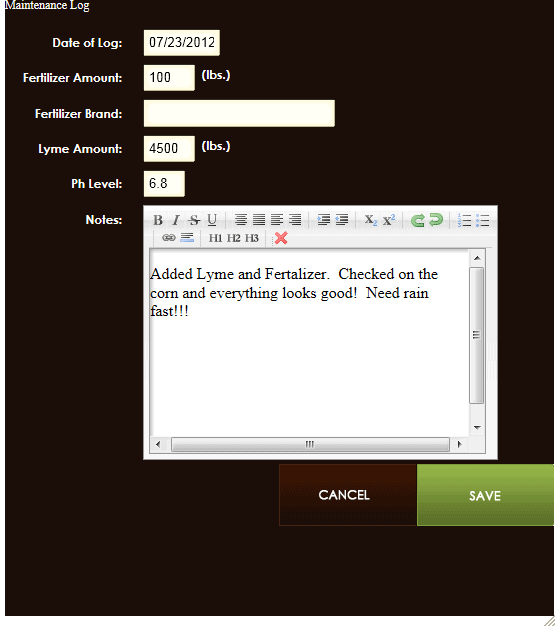 Now you can begin maintaining the information on the food plot log. 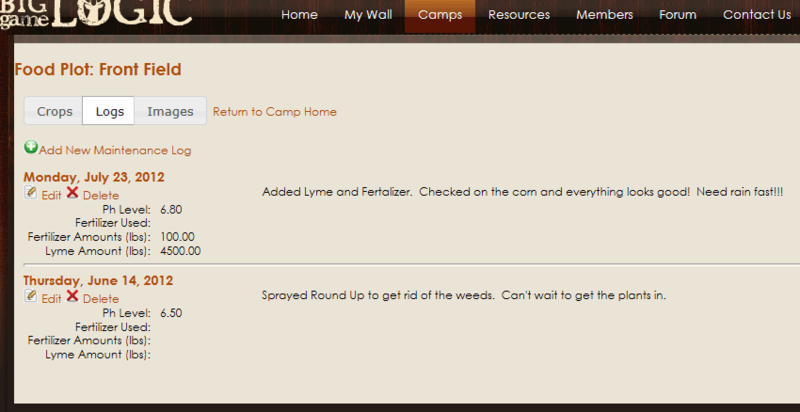 To do this, you can either click on the plant icon in the middle of your food plot on the camp home page, or from the edit/add items tab. 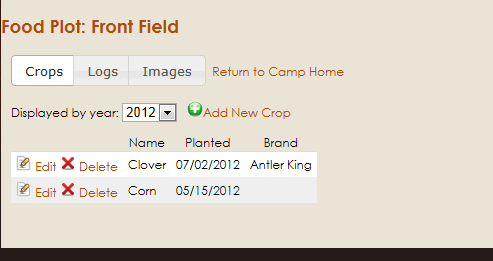 Either way, once you click on the plant icon, you will be given the option to view the food plot info. There are three 3 tabs for the food plot. Crops, Logs, Images. The three tabs mentioned are listed here, it defaults to the crops tab. It also default to the current year. As the years go by, you can view previous years by clicking on the Displayed by Year list box and go back. This is very helpful in helping you pick up trends and maintenance patterns throughout the years. 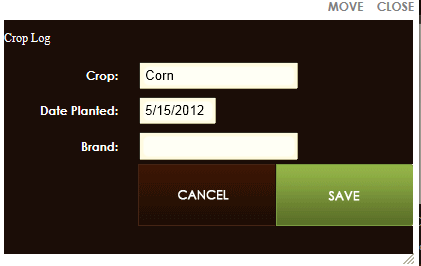 With the crops tab, you can list all the crops you have planted for the year designated. It will default for the current year, but you can use the drop down list to get the info for previous years. To add a crop, click on Add New Crop. A pop up window will appear and you will now have to enter the type of crop, the date planted and the brand (if Applicable) You can add as many crops as you want. The log tab allows you to enter any type of information regarding maintenance to your food plot. We have included fields for fertilizer and lime. Any other information regarding maintenance can be added in the text box. I would keep any data regarding the condition of the crops, whether or not you mowed, or any other information you want to share with the camp. This information will be shared to all your camp members. 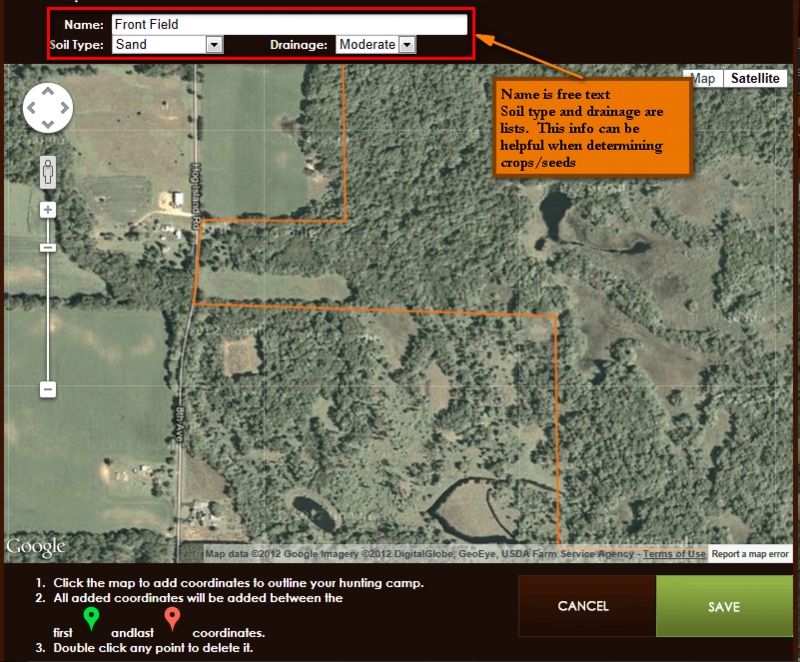 It’s a great tool to use for updating fellow camp members on the food plot’s progress. Here you can keep a photo journal of the condition of your food plot. This is great to share with the rest of the members in your camp. To add photos, Click on Add New Photo, a pop up window will appear. Click on Browse, search for you image, click to add.The file path will be displayed in the text field. Now add a description so everyone knows what they are looking at. Then click save. 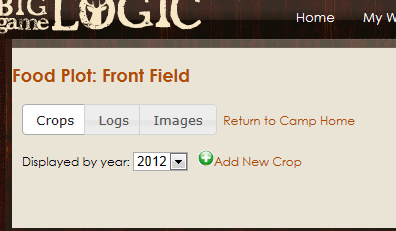 This information can now be view as an album under the Images tab in the Food Plot Information page.